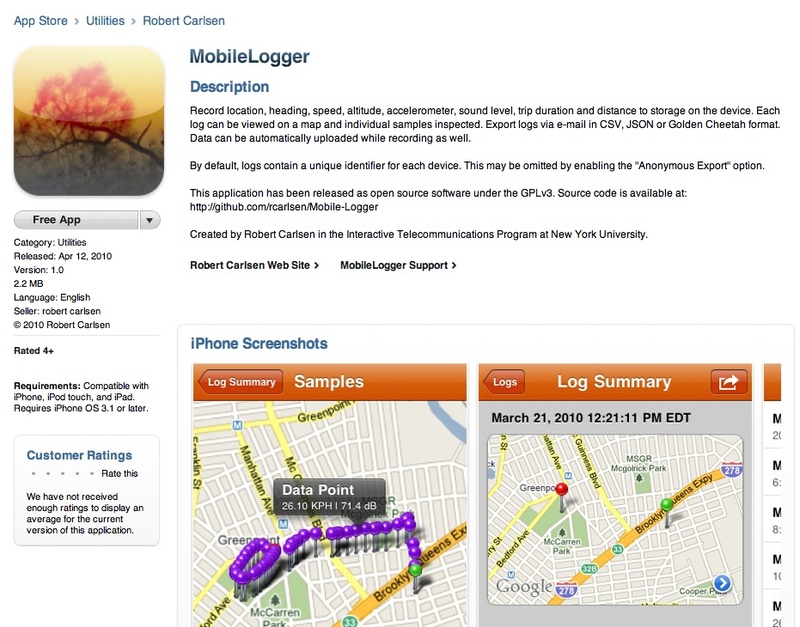 exploration » Blog Archive » Mobile Logger on the App Store! exploration | Mobile Logger on the App Store! « …here goes nothing. Mobile Logger submitted. 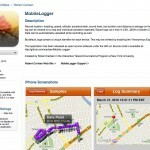 Mobile Logger on the App Store! After several rounds of rejection, Mobile Logger has been accepted and is available on the App Store! Feel free to try it out; hopefully some folks will find it useful. The source code for the application has been released under the GPL and is available on github. I’m still actively recruiting participants for my ongoing thesis project, which involves visualizing cyclists in New York City. If you’d like your riding to become incorporated in some pretty pictures to be presented in May, then by all means start logging (and thank you in advance)! Be warned, it’s a battery hog. Feel free to let me know if it gives you any trouble. This entry was posted on Monday, April 12th, 2010 at 23:15	and is filed under iphone, itp, Telling Stories with Sensors, Thesis. You can follow any responses to this entry through the RSS 2.0 feed. You can leave a response, or trackback from your own site. Woot! Nice job. I’m jumping from a G1 to an Iphone in May when my contract ends and will definitely have a play with this. Hey Rob! Does data from Mobile Logger plug into whatever system you used for the seismicycling visualizations? I want to explore visualizing turbulence experienced from walking, biking, and driving and I’m wondering if the iPhone would return data as exciting as your custom hardware did. The seismicycling project used an iPhone application as well…no custom hardware there. However that application recorded at 10Hz. MobileLogger records at 1Hz, since I’m most interested in location and the GPS unit doesn’t seem to update at less that one second resolution. Behind the scenes, both are uploading to an online database (couchDB)…and the seismicycling visualization can display data from the MobileLogger app database, albeit at the lower resolution. Currently, the app is just recording at the fixed interval. I’m interested in looking at augmenting that with recording specific events, to catch things that may fall between the sampling interval.